In this comic I learn more about character movement and have probably utilized nearly all of the standard camera shots I learned. On another note I'm sure all of you have seen "best sisters play" on machinima. 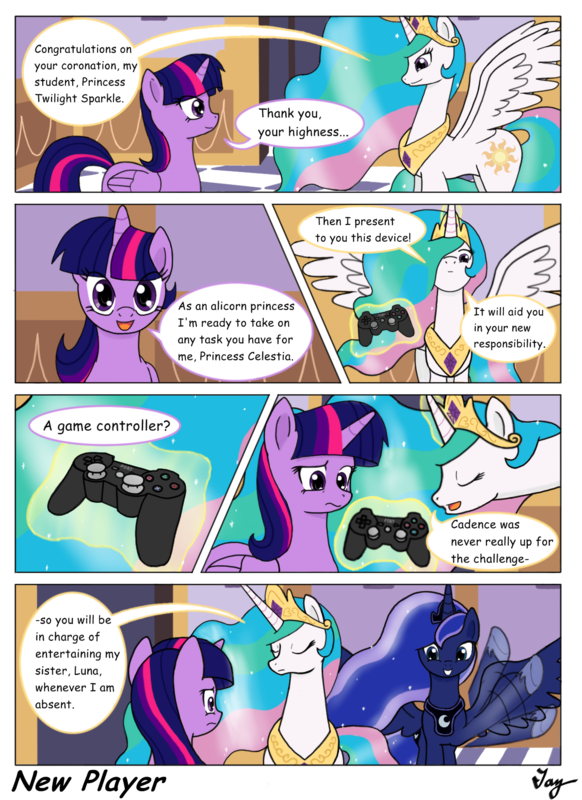 Basically Luna and Celestia are Gamefreaks! Why a PS3 controller? Because its about the only game system I ever play anymore and I grew up loving the Playstation X. Anyway, Thanks for looking everyone! See you again soon! So I guess that makes three ponies interested in human culture. How do you think they all know about us? How luna knows Video Games? Luna, in fanart, is a gamer. So I guess that makes three ponies interested in human culture. How do you think they know about us? Celestia: now you must face the greatest challenge ever twilight! Twilight: i can handle it! Celestia: you must play DARK SOULS 1-3! For the good of clestia!!! Can I take that job instead!? XDD ill take that job off her hoofs! can i switch places with Twilight? Just accept it Twilight, I think you won't regret it. Most definitely! Just send me a note on which comics you want to dub and you can be on your way. What is the point of these forced chains? AGAIN ?? Oh come on! !